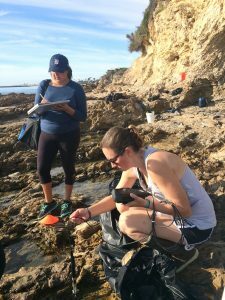 We seek to understand the factors that determine how many species live in a particular location and how that diversity, in turn, influences key biogeochemical processes. Research in the Bracken Lab has examined how nutrients, consumers, and physical stress interact to determine the richness, evenness, biomass, and community composition of seaweeds on rocky shores (Bracken & Nielsen 2004, Altieri et al. 2009, Bracken et al. 2011, Williams et al. 2013). These changes in richness, biomass, and evenness can have major effects on local-scale nutrient uptake and photosynthesis in seaweed assemblages (Bracken & Stachowicz 2006, Bracken et al. 2008, Altieri et al. 2009, Bracken et al. 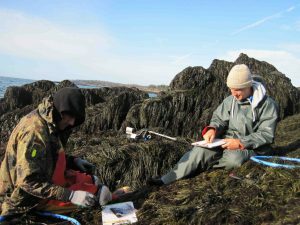 2011, Bracken & Williams 2013), and even weak and inconsistent local-scale effects of seaweed diversity on productivity can scale up to strong and consistent effects at regional and coastline scales (Bracken et al. 2017). We have found that realistic changes in diversity, such as those associated with certain species’ susceptibility to disturbance, can have much different effects on nutrient uptake than random changes (Bracken et al. 2008) and that for realistic (as opposed to random) assemblages of species, a gradient in species richness is required to maximize multiple functions (e.g., nutrient uptake and photosynthesis; Bracken & Williams 2013). Collectively, these results highlight the need to appreciate the causes of diversity change in natural ecosystems. Furthermore, realistic losses of rare sessile species – particularly seaweeds – from the base of an intertidal food web disproportionately impact the diversity and abundance of consumers at higher trophic levels (Bracken & Low 2012). Herbivores do not just eat primary producers, they can also dramatically affect those producers’ access to critical limiting nutrients. This can occur in two basic ways: (1) via nutrient inhibition, where consumers affect the abilities of producers to access nutrients and (2) via nutrient facilitation, where consumers add nutrients to an ecosystem, facilitating producers at local scales. Our research examines both aspects, including projects that have examined how herbivores selectively graze on seaweeds, reducing the abilities of both individuals and entire algal assemblages to acquire nitrate (Bracken & Stachowicz 2007, Bracken et al. 2011). We have also shown that consumers excrete ammonium (Bracken et al. 2018), enhancing seaweed diversity and growth on even the most wave-swept rocky shores (Bracken 2004, Bracken & Nielsen 2004, Bracken et al. 2007, Aquilino et al. 2009). 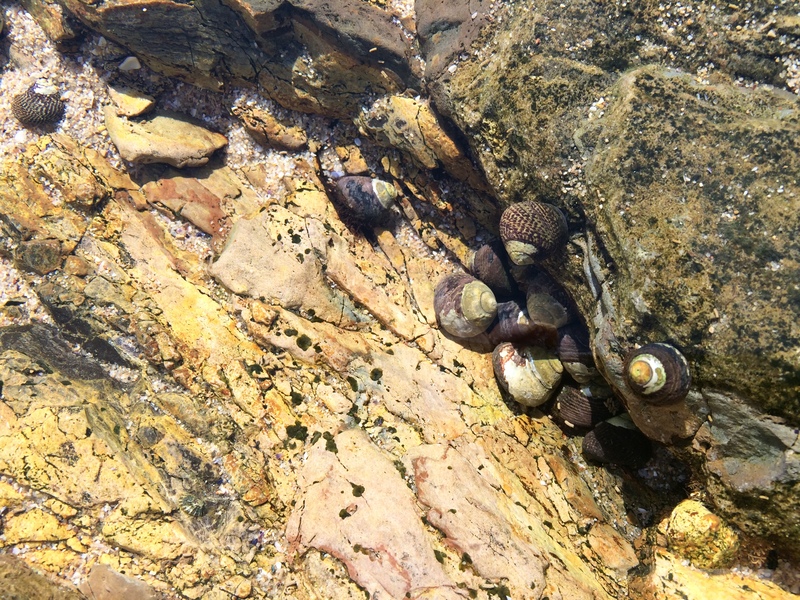 Recently, we have shown how community context modifies the top-down (i.e., consumptive) versus bottom-up (i.e., nutrient recycling) roles of grazers on rocky shores (Bracken et al. 2014). Current work in tide pools on the California coast indicates that in locations characterized by chronic nutrient limitation (e.g., the Southern California Bight), primary producer abundance is positively related to herbivore abundance due to the importance of local-scale nitrogen regeneration and enhancement of algal recruitment by the herbivores. This project addresses fundamental gaps in our knowledge of how changing environmental conditions will impact the earth’s species and ecosystems. One of the main challenges is predicting impacts of multiple environmental stressors changing at the same time within highly dynamic ecosystems. Climate simulations in coastal marine habitats will, therefore, yield critical information about likely future changes in biodiversity and ecosystem health. This work aims to uncover the trajectory of climate change impacts and interactive responses to multiple climatic stressors on coastal marine species, communities, and ecosystem functioning. To uncover these links, we will (1) quantify seasonal and diel dynamics under ambient conditions in a benthic marine community, (2) conduct factorial manipulations of two climatic stressors – increased carbon dioxide concentrations and temperatures – and measure impacts on physiology, diversity, and productivity, and (3) conduct a second field experiment to evaluate whether productivity responses are due to changes in physiology or biodiversity. 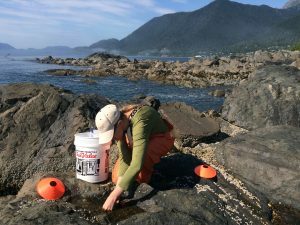 Climatic changes have the potential to influence ecosystem functioning by altering physiology, abundance, and community structure (i.e., biodiversity), and this research specifically aims to partition these different pathways, leading to more effective predictions of impacts on benthic marine ecosystems. Humans are modifying marine food webs both from the top-down, by reducing consumer abundances, and from the bottom-up, by adding nutrients to coastal habitats. Predicting these impacts is complicated because herbivores affect primary producers both from the top-down, by eating them, and from the bottom-up, by recycling nutrients and facilitating the recruitment of algae into local marine ecosystems. 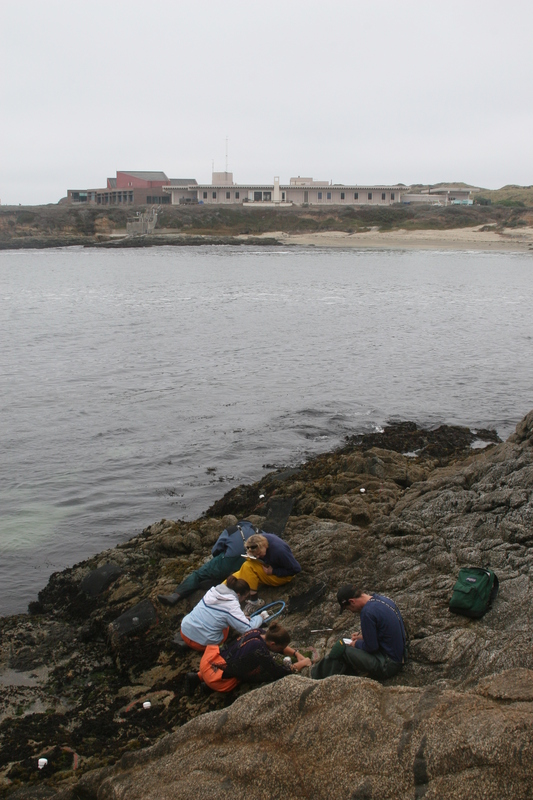 This project uses experimental manipulations along a natural gradient in nutrient availability on the California coast to evaluate the complex interactions between top-down and bottom-up processes in marine communities. Traditional experimental methods for herbivore removal result in the loss of both the consumptive and facilitative effects of herbivores. In contrast, our experimental design allows us to partition the different effects of herbivores on marine primary producers. These methods, including observations, experiments, and modeling approaches, allow us to (1) calculate the relative importance of herbivores’ consumptive and facilitative effects on algal diversity and abundance; (2) determine the effects of temperature, nutrients, and herbivores on the microbial community; and (3) evaluate the relative importance of internal processes and spatial subsidies. Dasysiphonia (previously Heterosiphonia) japonica is a rapidly spreading marine invasive macroalgal species in New England coastal waters, where it achieves abundances much higher than those in its native range. However, we currently lack detailed information on the in-situ distribution, abundance, and impacts of this invader. Little was previously known about the ecological interactions of Dasysiphonia anywhere, likely because it became noticeably abundant in Europe relatively recently and is inconspicuous in its native range in eastern Asia. 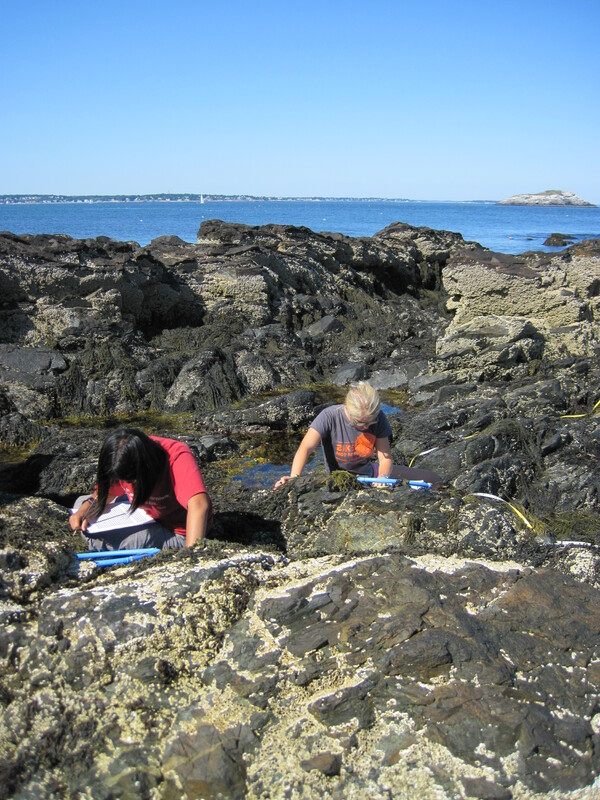 We conducted observations and experiments to (1) determine the presence and abundance of Dasysiphonia at sites spanning its entire invaded range on the New England coastline (Newton et al. 2013); (2) quantify habitat characteristics across the invaded range to assess physical and biological attributes correlated with the success of Heterosiphonia; (3) quantify the impacts ofHeterosiphonia on recipient communities (Ramsay-Newton et al. 2017); (4) determine growth rates of Heterosiphonia relative to native taxa; and (5) characterize rates of herbivory on Heterosiphonia and native taxa (Low et al. 2015). Because species mediate key biogeochemical processes and play unique ecological roles, changes in the diversity and composition of species in an ecosystem can alter how that system functions. A growing body of work has demonstrated that changes in biodiversity can have profound effects on the functioning of marine ecosystems. However, key unresolved issues remain with respect to relationships between marine biodiversity and ecosystem functioning. In particular, the vast majority of experiments have evaluated the consequences of biodiversity changes at only one location, so we currently have very little knowledge of how diversity-function relationships are modified by environmental context. We examined, in the field, how marine diversity-function relationships change across spatial scales from local to regional to the New England coast. Work was conducted at 9 rocky intertidal sites, 3 sites in each of 3 regions spanning 500 km of the Gulf of Maine coastline. These factorial experiments involved manipulations of seaweed diversity and grazer abundance at sites in the vicinity of East Point, Massachusetts; the Boothbay region of Maine; and Quoddy Head, Maine. We found that spatial scale mediated the effects of seaweed diversity on biomass production, with weak and/or inconsistent effects at sites scaling up to strong, consistent effects at regional and especially the coastline scale (Bracken et al. 2017). Because the diversity of species in an ecosystem is influenced by a variety of factors, it is important to understand both how diversity is altered by these factors and how the resulting changes in diversity influence the transformation and flux of energy and matter in that system. Historically, most research linking diversity and ecosystem-level processes was done in terrestrial ecosystems and used random assemblages of species to experimentally assess diversity’s influences on ecosystem functioning. While these previous studies suggested that diversity influences processes such as productivity, nutrient cycling, and energy flow, they did not evaluate the consequences of nonrandom changes in biodiversity associated with factors such as nutrient availability, consumers, biological invasions, abiotic stressors, local extinction, and habitat loss. We studied the consequences of nonrandom biodiversity changes by conducting observations and experimental manipulations of intertidal seaweed assemblages to determine the influences of abiotic stress, consumers, and nutrients on diversity (Williams et al. 2013). 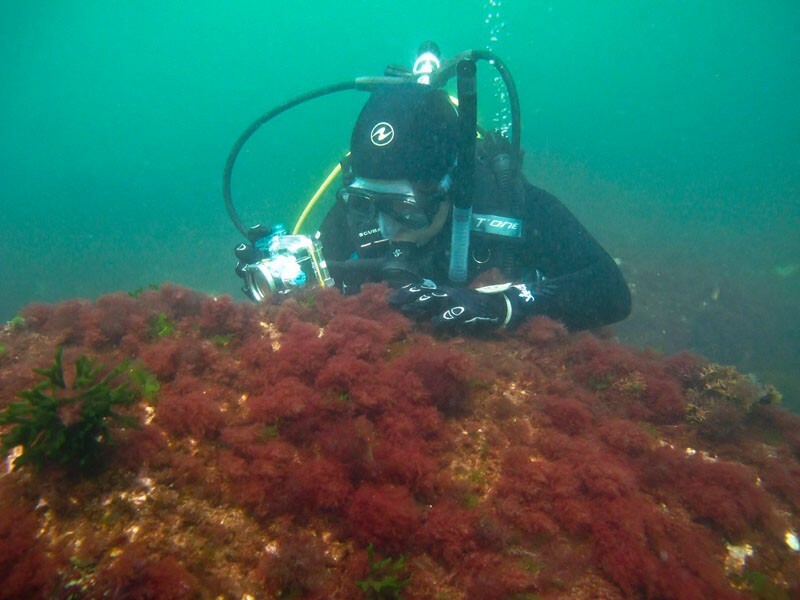 Rocky intertidal seaweeds are an optimal study system for evaluating these effectors of biodiversity change, as previous research by ourselves and others has demonstrated dramatic impacts of disturbance, herbivory, and nutrient availability on seaweed diversity. We performed complementary field and laboratory experiments in the Bodega Marine Reserve and at the Bodega Marine Laboratory on the northern California coast to assess the influences of these nonrandom biodiversity changes on ecosystem-level processes, including seaweeds’ growth, photosynthesis, and nutrient uptake rates (Bracken et al. 2008, Bracken et al. 2011, Bracken & Williams 2013).